DVRC receives no federal or state funding. Primary funding for the center comes from education programs, memberships and donations. Your donation is tax-deductible. Come see us at a Public Event! Check out our Close Encounters Brochure. 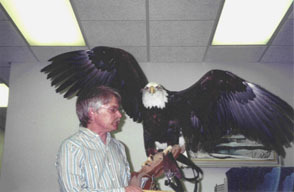 and conservation of birds of prey. Bookmark our site and come back often for new articles! !